"Hast thou not known? hast thou not heard, that the everlasting God, the Lord, the Creator of the ends of the earth, fainteth not, neither is weary? there is no searching of his understanding. He giveth power to the faint; and to them that have no might he increaseth strength." Researchers at the University of Virginia have found that most people perceive a hill to be steeper than it really is, especially if they are tired or carrying a heavy load. When asked to estimate the slope of a hill, test participants consistently misjudged it, thinking a 10-degree slant was about 30 degrees, and rating a 5-degree slope as nearly 20 degrees. Hardly any of them believed they could be that far off. When we are burdened and exhausted, even a minor problem can seem too big for us to handle. As we encounter a trial in life, we are tempted to sit down at the base of that difficult hill and stay there, convinced that the grade is too steep for us. And yet, Christ is there for the believer (Matt. 11:28-30). That is why we need the encouragement of God’s Word. It draws our attention to our loving God, who knows our need. Zephaniah wrote, "The Lord thy God in the midst of thee is mighty; he will save, he will rejoice over thee with joy; he will rest in his love, he will joy over thee with singing." (Zeph. 3:18). Trusting in God's Word is key as you'll read in Psalm 119:40-41, "Behold, I have longed after thy precepts: quicken me in thy righteousness. Let thy mercies come also unto me, O Lord, even thy salvation, according to thy word." Because we so easily misjudge life’s difficulties, we need courage to keep going when we are tempted to quit. Take a step of faith today and put your entire trust on the Lord. Don't lean on your own understanding (Prv. 3:5-6). It's going to get you nowhere except back at the bottom of the hill. 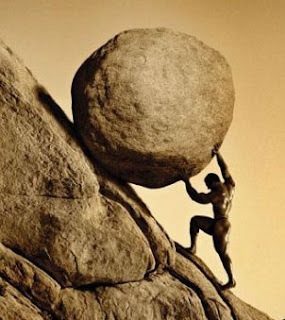 Consider the testimony of someone who knows: Sisyphus. In Greek mythology, he was the founding king of Corinth (how ironic) who punished by being compelled to roll an immense boulder up a hill, only to watch it roll back down, and to repeat this action forever. In common parlance, the word sisyphean means "endless and unavailing, as labor or a task." And, in modern terms, the myth of Sisyphus is understood as a representation of a life made meaningless because it consists of bare repetition. If you are burdened because of life's trials or work or family or physical illness or depression or whatever else that may be draining you, take heart. Jesus Christ never intended for you to carry that load alone. When Paul sought the Lord's removal of his "thorn", Jesus responded that His grace was sufficient (II Cor. 12:7-10). 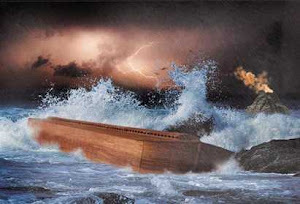 Remind yourself through God's word (and trust wholly in Him) that God will work things (Rom. 8:28). Our steps He will guide and keep. God always gives enough strength for the next step. Wait for the Lord and see that He is faithful to His Word. Isaiah 40:31 reassures us, "But they that wait upon the Lord shall renew their strength; they shall mount up with wings as eagles; they shall run, and not be weary; and they shall walk, and not faint." I'm Tired of Going Uphill. Save Me Jesus!